Recently, Bangkok Airways Public Company Limited (PG) led by Mr. Pakorn Rattanarod, Director- Route Profitability and Alliance and Oman Air (WY) led by Mr. Aboudy Nasser, Senior Vice President - Network Planning & Revenue Management signed codeshare agreement, which will provide customers with an enhanced network to travel between Oman and cities in Thailand, commencing on 1st April, 2018. Under the agreement, Oman Air puts its "WY" designator code on Bangkok Airways flights, serving 8 routes on domestic. This includes roundtrip routes on Bangkok-Chiang Rai, Bangkok-Chiang Mai, Bangkok-Phuket, Bangkok-Krabi, Bangkok-Lampang, Bangkok-Trat, Bangkok-Sukhothai and Bangkok-Samui, according to Bangkok Airways. 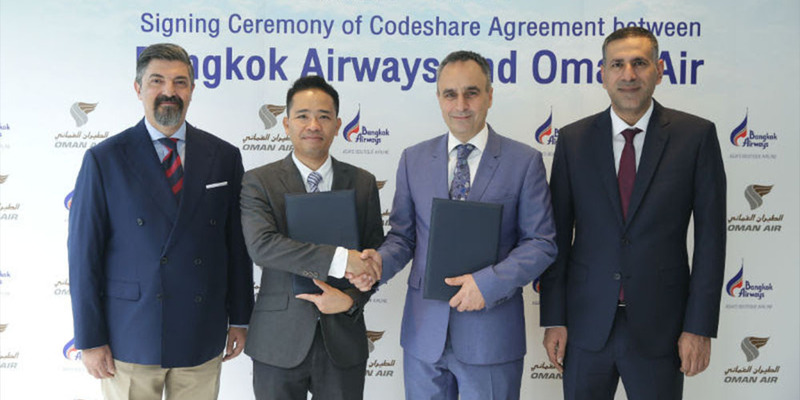 This new codeshare partnership offers passengers enhanced connectivity and seamless connections to well known destinations in Thailand. Moreover, Oman Air's passengers traveling on Bangkok Airways will enjoy the boutique airline's unparalleled services such as lounge access and in-flight meal.